Oman is bordered to the west by the United Arab Emirates, Saudi Arabia, and the Republic of Yemen. The Musandam Peninsula forms a coastal enclave on the Strait of Hormaz. The 1700 miles of coastline are surrounded by the Arabian and Indian Seas. The Hajir Mountains divide the land stretching from the Musandam Peninsula to the Southeast. To the west lies the fertile narrow plain of the Batinah coast dominated by the Jebel Akhdar (The Green Mountain, noted for its picturesque terraced villages). 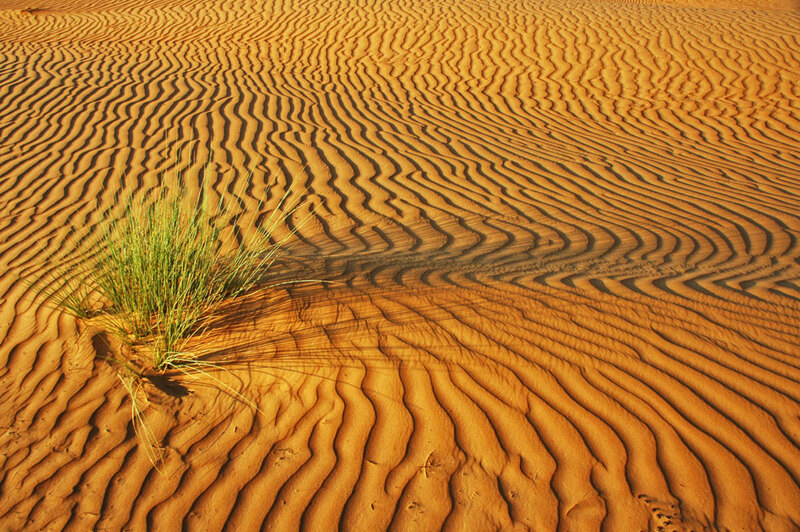 In the south, set apart by a desert, Dhofar has a coastal plain, beyond which are mountains. Out to sea are the Kuria Muria Islands. The Batinah coast is inhabited by descendants of Asian merchants, Baluchi traders and other Arab nationals, who are more in contact with the international community than the tribesmen of the interior and mountains. Along the coast at Muscat and Matrah, Arab traditions remain strong despite increasing Western influence. In the southern capital of Salalah are many black Omanis descended mainly from former slaves, whereas the interior is populated by the nomadic Bedouin. The months of June and July are particularly hot. Rainfall varies according to region and in Salalah between June and September there is a light monsoon rain. In terms of clothing, lightweight clothes are worn throughout the year with something slightly warmer for cooler winter evenings. It is also advisable to pack some light rainwear. 309,500 sq km (119,500 sq miles). Arabic is the official language. English is widely spoken. Swahili is also spoken by the population from East Africa. 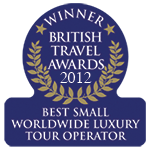 German and French are spoken by hotel staff. Salalah is the capital of the southern region. It is a city set amongst coconut groves and banana plantations, sprawled along sandy beaches that run the length of its plain. The lush vegetation makes Salalah seem almost tropical. 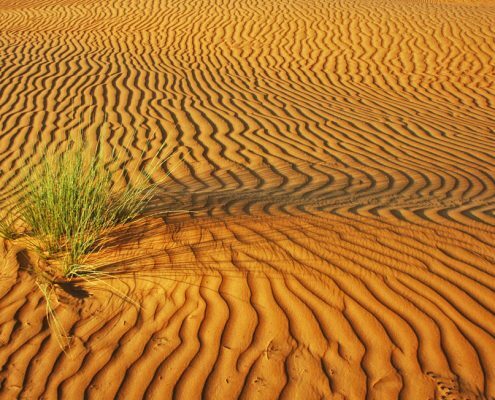 Sur is situated in the north-eastern province of Sharqiya. It is a seafaring town, a fishing village and a trading port all rolled into one. Famous for its traditional ship building, Sur started trading along the African coast as early as the 6th century. It is an old town with winding streets, carved wooden doors and old arabesque buildings. Sohar has a very large souk (market) full of tailors, fruit-sellers and fishermen. An imposing 4 storey fort with six towers overlooks the bay. 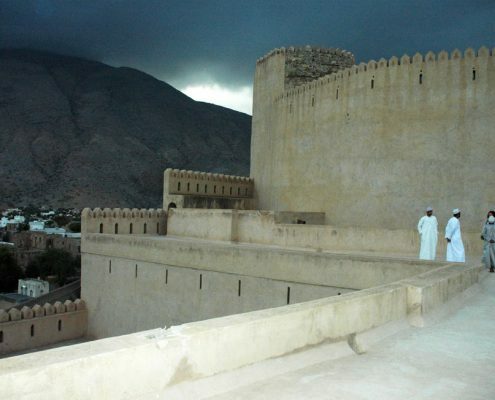 Nizwa is the main town in the interior province. It was the capital in the 6th and 7th centuries. 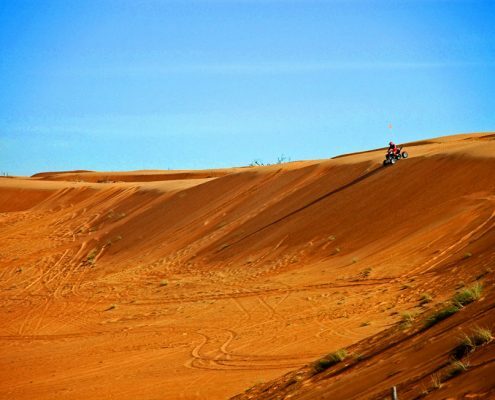 The town’s immense palm oasis stretches for 13km (8 miles) along the course of two wadis. It is famous for its fort and its gold and silver handicrafts. 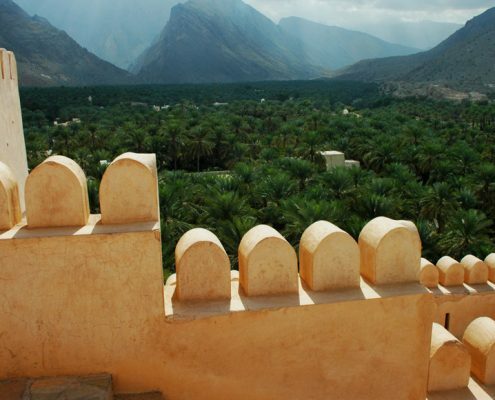 Jabrin has a 17th century fortified palace here, notable for its painted wooden ceilings and the splendid view across the desert to the mountains. 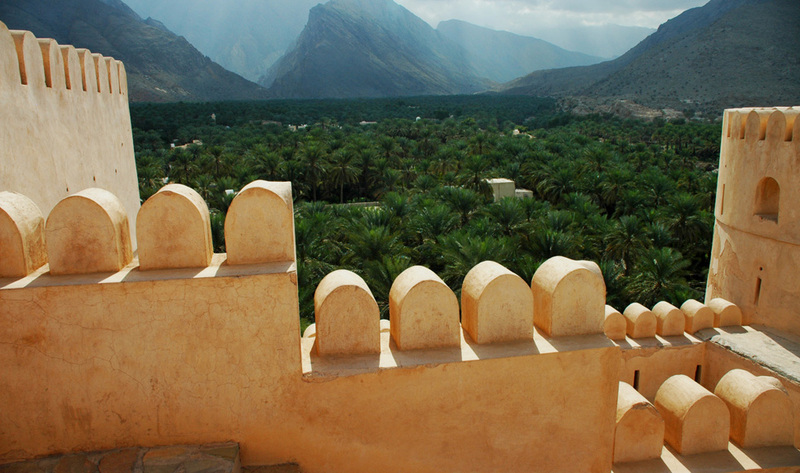 Bahlah is an ancient town known for its pottery with a good souk and close to the picturesque village of Al Hamra. 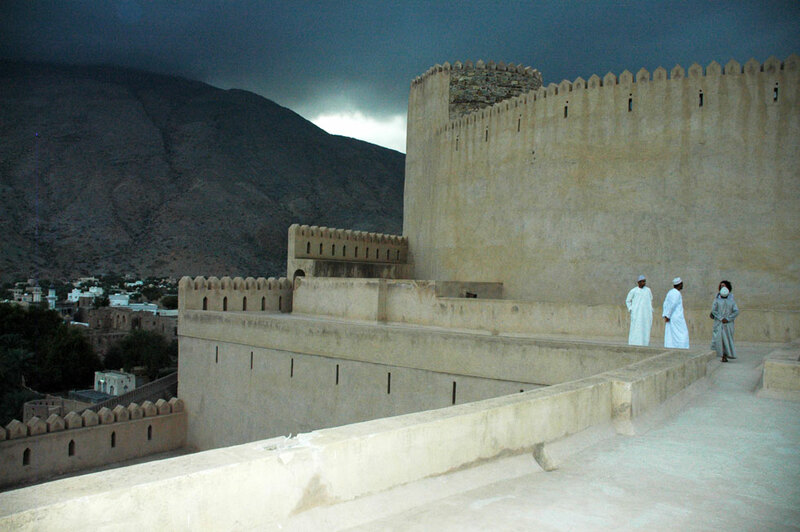 Al Hazm fort is perched on the northern slopes of the Jebel Akhdar, and was built in 1708. The oasis town of Rustag is also on the slopes of the mountain.Qurum encapsulates Oman’s archaeology, history and culture. The National Museum has a collection of silver, jewellery, weapons and ancient stone artefacts. From here dhows cruise along the palm-fringed coast and there are excellent fishing grounds and beaches. Oman’s delayed debut into the modern world has been conducted with enormous sensitivity for traditional values, meaning that the country’s rich cultural heritage can still be appreciated to the fullest extent. It is nonetheless one of the most developed and stable countries in the region, and extremely safe as a travel destination. In Muscat make sure you while away an afternoon in a popular coffee house and sample the ubiquitous soft, mouth-watering dates. 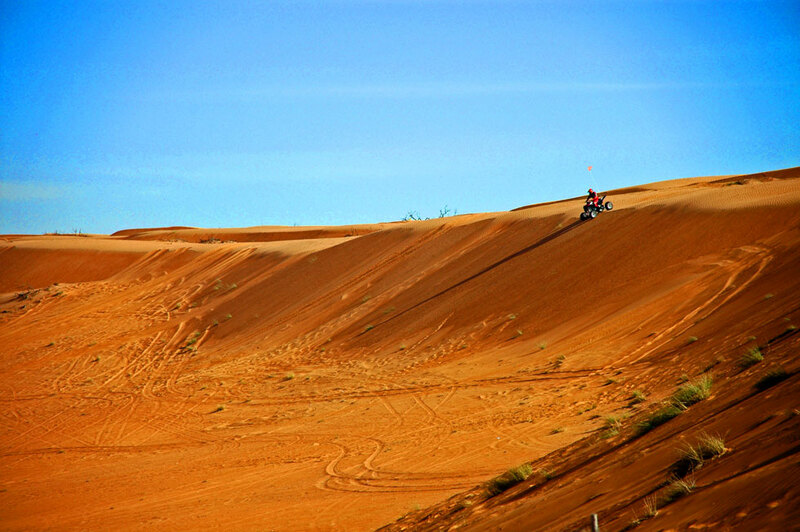 2700 miles of beautiful, empty beaches and enormous sand dunes that have never seen a footprint mean it is as easy as anything to find a corner of Oman’s untouched beauty to yourself. Archaeological excavations have recently shown that much of the civilisation in Oman predates the Arab period. The region embraced Islam early, during the lifetime of the Prophet. During the eighteenth and nineteenth centuries, the Sultans of Muscat were often powerful figures in Arabia and East Africa, often coming into conflict with the colonial powers in the region, particularly the Portuguese, who first settled in the sixteenth century, in an attempt to protect their eastern trade routes. Close ties have been maintained with Britain since 1798, when a treaty of friendship was concluded. The country was known as Muscat and Oman until 1970. British influence remains strong in the region but the number of British advisers occupying key positions in Omani Government Department, substantial during the early days of the present regime, has steadily dropped and is now limited to a handful of advisers in key posts. During the early years of his reign, which began in 1970, the hereditary leader Sultan Qaboos’ overriding priority was to deal with an insurgency in the western part of his kingdom, conducted by the Popular Front for the Liberation of Oman (PFLO) with the backing of the People’s Democratic Republic of Yemen (South Yemen; since unified with North Yemen). The defeat of the rebels increased both domestic and foreign pressure on Qaboos to introduce democratic reforms. A series of gradual measures have been introduced to modernise and liberalise what was previously an autocratic regime. Two Consultative Assemblies, the Majlis as-Shura (which evolved from the old Consultative Assembly) and the more recently formed Majlis al-Dawlah, were originally groomed to take on the functions of a Bicameral Parliament at the turn of the millennium. This has not happened, nor is it likely to do so in the foreseeable future. The two Majlis have some influence over domestic matters, and the franchise that elects them has been steadily expanded to include all men and women over the age of 21, but no say in foreign policy or matters of defence. The most recent poll for the Majlis as-Shura in November 2003 found little change in its population: no formal political parties are allowed but most support the Sultan. Relations with Oman’s close neighbours have been friendly, especially with Yemen, since the end of the PFLO insurgency and the unification of Yemen itself. 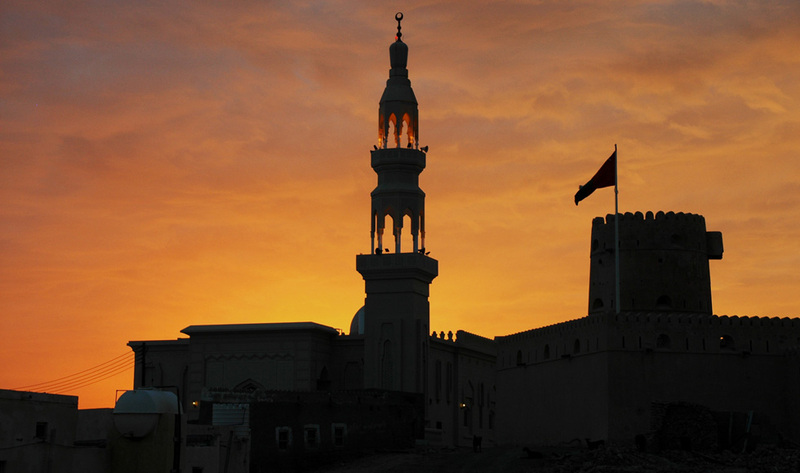 Recently, Omani concerns have been focused further afield. In 1981, Oman was involved in founding the Gulf Co-operation Council and has been instrumental in promoting its increased involvement in regional security matters. The country’s strategic importance to the West has been highlighted during the last two decades, functioning as a staging post for Anglo-American military, naval and air operations during the Iran-Iraq War, the counter-invasion of Kuwait and, more recently, the invasions of both Afghanistan and Iraq. In 1994, Oman was the first Gulf state to establish official relations with Israel. Since 1998, it has also developed a good relationship with Iran, now extending as far as mutual security co-operation in the Gulf. Aside from limited protests in January 2011, small-scale in comparison to neighbouring Middle Eastern countries, Oman weathered the so-called ‘Arab Spring’ quietly. Government efforts largely placated protesters, and Oman has not seen significant demonstrations since May 2011.